Would You Trust 50% Of Your Stock Monies To 3 Companies? We all know about concentration risks; if you only have a few stocks and one or two of them fail, your portfolio takes a large hit. But what about over-concentration safety and security. Can we be too confident in our 'safer' or defensive picks? The Canadian banks have beat just about everything over the last two decades, including the world's greatest investors. Can I take my big Canadian banks to the, well, retirement bank? I'll admit to having a high level of confidence with the big banks, they have treated me very well over the decades. I'll admit to having been in and out of a couple of them over that period. I finally learned how to invest several years ago; let's just say it took me a while. But it's not just my personal experience with the big Canadian banks as an investor, as an employee or supplier; my research into the obvious long-term trends bolsters my confidence. Is that confidence misguided? In Canada, the largest Canadian banks are known as the Big 5. Those banks are Toronto-Dominion (TD), Royal Bank (RY), Scotiabank (BNS), Bank of Montreal (BMO), and Canadian Imperial Bank of Commerce (CM). Of course, there are US listings for all of the Big 5. US investors are able to grab some 'international' diversification. Essentially, US investors would be investing in their largest trading partner. You might also be well served to go overseas with a developed market ETF, iShares MSCI EAFE ETF (EFA), or even a developing market fund such as the iShares Core MSCI Emerging Markets ETF (IEMG). Here are those big banks vs. a popular benchmark ETF for Canada, the TSX 60 as represented by XIU on the Toronto stock exchange. The fund is a little more concentrated than the broader TSX indices and it will offer a slightly greater exposure to the big banks. Given that greater exposure to the big banks I suggest that as an option for Canadians on my Model ETF Portfolio page. If a Canadian wanted to go even further down that bank lane (Bay Street), there are options that would allow investors to grab an equal weighted bank-only ETF or the big banks with a covered call layer, offered by BMO. Here's the chart. The big 5 Canadian banks are Portfolio 1. The benchmark is XIU. The time period is January of 2000 to end of October 2018. The chart is courtesy of portfoliovisualizer.com, and as always, past performance does not guarantee future returns. The holdings are in Canadian dollars. We can wrap that up in two words - no contest. 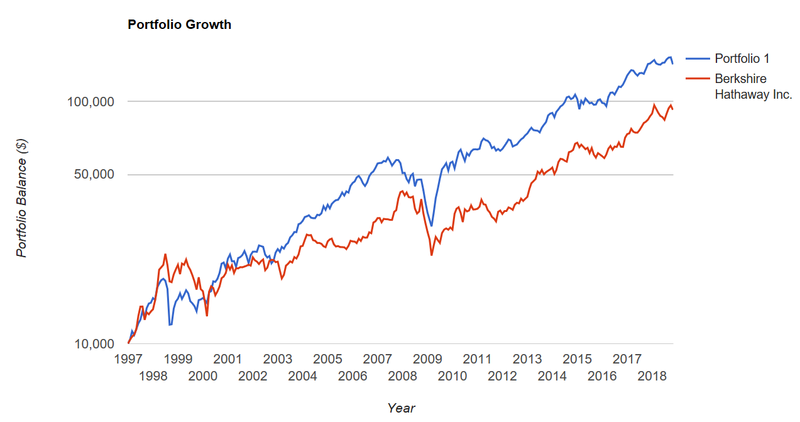 We can see a massive outperformance in the correction of 2000-2003. Of course, US stocks (IVV) experienced that Lost Decade when broad-based stocks markets delivered zero returns or virtually no returns for 10-year periods, from 1999, 2000, 2001 start dates. US investors with a severe home bias would have suffered greatly if they did not have international exposure. If they had exaggerated US tech exposure (as was the order of the day), the carnage would have been much worse for the lost decade. US and Canadian markets delivered negative years in 2001 and 2002; the US markets also added 2003 as a down year. The big Canadian banks were positive, and delivered incredible (surprising) gains for the period. What's more impressive, perhaps, is that the big Canadian banks held up 'reasonably' well in the market correction of 2008-2009, considering that it was a financial crisis. Their sector got hit; the financial sector was the cause of the greatest stock market meltdown (by drawdown) since the Great Depression. Of course, though, it was the US financials that brought that destruction on us. The Canadian banks were shown to be more than well-run, they virtually held none of the sub prime investment junk. The big Canadian banks did not cut dividends, they held their dividends steady. And in fact, regulators did not allow them to increase their dividends. Many banks reported after the fact that given a free hand, they could have continued the long history of increasing dividends through the financial crisis. And here's the big Canadian banks vs. the world's greatest investor, Warren Buffett. Yes, we are mixing currencies here. The history of the US vs. Canadian dollar is a back and forth, with the US dollar generally greater/stronger by some 20%. If one was a long-term investor, this would not be much of a concern as that US investor would be buying when the US dollar is at times lesser than and greater than the Canadian dollar. And of course, US investors can purchase the banks in US dollars on a US exchange, but there is certainly currency exposure with respect to stock price and dividends. Do your research on withholding taxes for Canadian dividends. There is no withholding tax in certain US registered account types. Portfolio 1 is the big Canadian banks, the benchmark is Berkshire Hathaway (BRK.B). The availability of assets allows us to go back to January of 1997. At times, this is a contest, but once again, the clear advantage goes to those big banks. We also know that while Berkshire Hathaway is a very well diversified conglomerate, it is also classified as a financial. So how much is too much? There's already 'too much' exposure to financials within the Canadian indices - or so say the experts. Here's the sectors and percentages for that XIU. 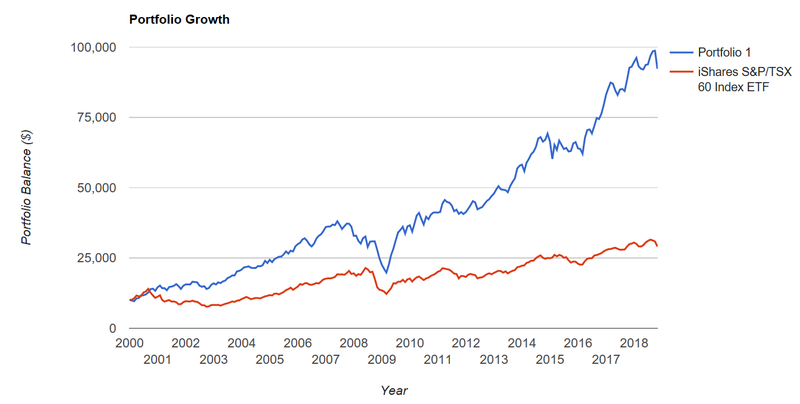 As I often write, and as I would tell clients in my days as an advisor on the index-based Tangerine Portfolios, the Canadian market does not make for a great investment on its own, it's simply not very well diversified. More than most people, Canadians need that US and international diversification for sector and currency exposure. We're known as having a petro dollar, and the US in particular is a wonderful counter balance given the broad sector diversification of US markets, and that potential inverse relationship between the US dollar and oil prices. Why not just invest in the big Canadian banks. As Canada goes so goes the Canadian banks. But the big banks do better than the market. The big banks make money at every Canadians economic touch point. It's a well known oligopoly situation. Oligopolies offer protection, right? Larry knows well of the oligopoly situation, and he knows of Canadians' great attachment to, and great trust in their beloved banks. That trust goes too far as Larry writes in Beat The Bank. It's a wonderful book that chronicles that attachment and how the big banks (and investors) profit from that attachment and (misguided?) loyalty. I'd suggest that it's a great read for Canadian and US investors. It's filled with many investment truths and common sense. In the end, Larry suggested that they were a wonderful long-term investment, and likely to continue to deliver on that front. He would also resort to the prudent stance that we have to be careful with ANY over-concentration, no matter how much confidence we have in the companies or group of companies, or sector. Oligopoly should not equal overconfidence. They also have the ability go into the cr@p&) every now and then. Many writers and analysts will certainly suggest that currently there are exaggerated risks in financials north of the border. Maybe it's our turn? Moody's warns Canadian banks face increased risk from rising consumer debt vulnerability. But back to the headline and subject for this article. I'll admit to some of that overconfidence. And my readers know that I have a concentrated portfolio for my personal retirement account with respect to my Canadian holdings. I do not expose my wife's accounts to that over-concentration risk; for Canadian holdings, she has the Vanguard High Dividend Yield offering - VDY on the TSX. When I look at my retirement portfolio assets, I see that my big 3 Canadian banks of TD, Royal and Scotiabank make up less than 24% of the total portfolio assets. The 3 biggest Canadian banks are 49% of my Canadian stock assets. 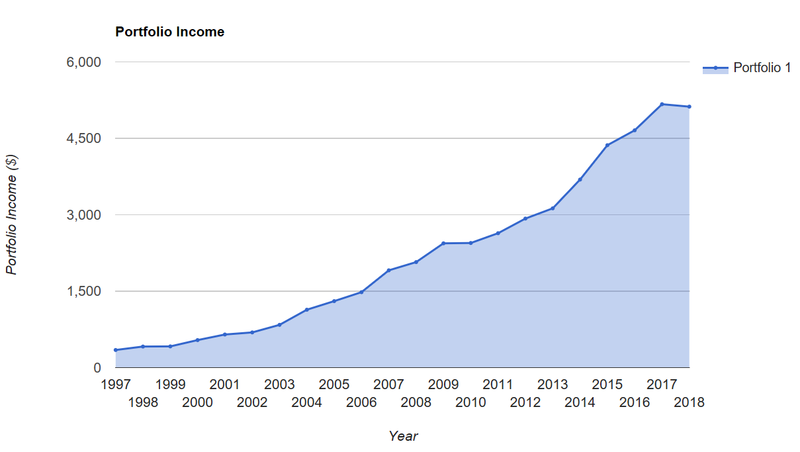 While I invest for total return potential, the dividend growth investor in me appreciates this long-term chart showing the income history with dividend reinvestment. Here's the portfolio income of the Big 5, based on an initial $10,000 investment. As many readers will know, the Canadians banks have been paying dividends for well over 100 years. As an example, this from the Scotiabank investor page. First dividend 1833, continuous 'since'. When a successful company delivers a generous portion of its earnings in dividends, that just might be enough for some retirees or semi-retirees. That capital appreciation might, in the end, be gravy. I am not averse to creating those homemade-dividends as well. Am I over exposed? Overconfident? Suffering from personal and recency bias. To frame the exposure, as a US investor would you put 50% of your US stock monies in 3 companies? Fire away, you'll find lots of room in that comment section below. Author's note: Thanks for reading. Please always know and invest within your risk tolerance level. Always know all tax implications and consequences. If you liked this article, please hit that "Like" button. If you'd like notices of future articles, click the "Follow" button. Disclosure: I am/we are long BNS, TD, RY, AAPL, NKE, BCE, TU, ENB, TRP, CVS, WBA, MSFT, MMM, CL, JNJ, QCOM, MDT, BRK.B, ABT, PEP, TXN, WMT, UTX, BLK. I wrote this article myself, and it expresses my own opinions. I am not receiving compensation for it (other than from Seeking Alpha). I have no business relationship with any company whose stock is mentioned in this article.